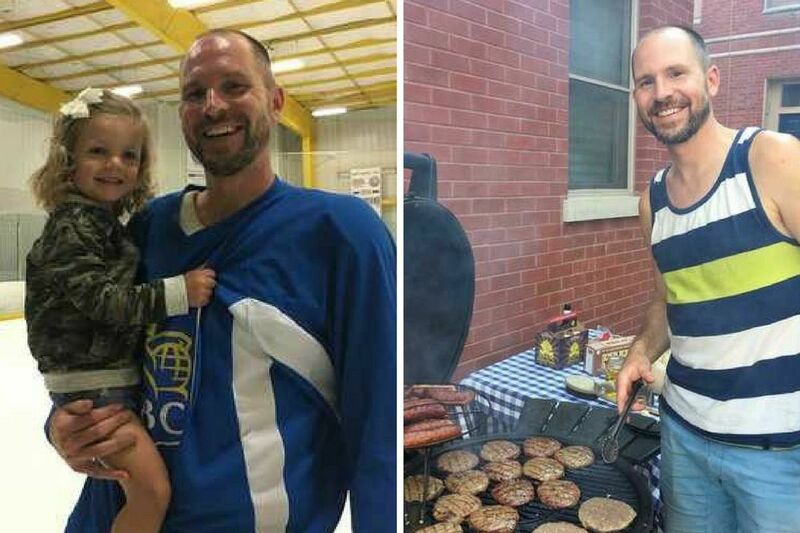 Gerard Grandzol seen in August 2017, with his daughter Violet, 2, at an ice hockey tournament in Voorhees, and barbecuing on his Spring Garden block. The Philadelphia District Attorney's Office, in a strongly worded response, opposes a defense request to send an alleged gunman's case to juvenile court in the September slaying of Gerard Grandzol, a Spring Garden neighborhood activist who was fatally shot in front of his 2-year-old daughter. Marvin Roberts, who was 16 at the time of the shooting, "committed a brutal, premeditated murder without provocation" and his "actions both during and after the killing warrant prosecution as an adult," prosecutors wrote in a court filing Tuesday. "The limits of the juvenile justice system are wholly insufficient to adequately address the seriousness of this senseless killing," says the response, a copy of which was obtained Wednesday morning by the Inquirer and Daily News. "Additionally, the transfer to juvenile court cannot begin to protect or serve the public interest." Grandzol, 38, was shot about 8 p.m. Sept. 7 outside his home on the 1500 block of Melon Street. He and his daughter Violet had just returned home from playing Frisbee on Lemon Hill in Fairmount Park when Grandzol was approached by two assailants in a robbery after he had gotten out of his SUV. He handed over his wallet, but not his car keys, asking the one robber with a gun to allow him to remove his daughter from her car seat. That's when he was shot twice in the face. Authorities have said surveillance video points to Roberts, of Tioga, as the gunman, and his older brother, Maurice Roberts, 20, of Frankford, as his partner in crime. Both are in custody, charged with murder, robbery, conspiracy, and gun offenses. On March 16, Marvin Roberts' court-appointed attorney, Eileen Hurley, filed a defense motion to send his case to juvenile court. In her motion, she contended that the younger brother is "clearly amenable to treatment" and that "transfer to juvenile court will serve the public interest." She has declined to comment on the case. Grandzol's wife, Kristin, who had learned earlier that week of the defense attorney's intention to file such a motion, feared that under District Attorney Larry Krasner's goal of seeking lighter sentences, the DA's Office would support the defense motion for the younger brother's case to be sent to juvenile court. "We're really happy and it's great news and I'm glad the district attorney is going to do the right thing," Kristin Grandzol, 34, said Wednesday after she learned that prosecutors were opposing the defense request. "We're trying to stay positive that justice will be served for Gerry." But Kristin Grandzol, who moved last month to Chester County with her two daughters, Violet and Rose — who was 6 weeks old when her father was killed — added that she's still concerned about the resolution of her husband's case. "I am still worried that there will be a plea deal and that Marvin Roberts, the shooter, will not get the time he deserves," said Grandzol, who hopes that both brothers will spend the rest of their lives behind bars. Ben Waxman, Krasner's spokesman, said Wednesday that the office doesn't comment on "prosecutorial strategies" in any open case. There have been "zero discussions" with defense attorneys on any deal, he added. If his case were transferred to juvenile court, Marvin Roberts would only remain under court supervision until he turns 21. The decision will fall on Common Pleas Court Judge Kathryn Streeter Lewis, who has not scheduled a hearing on the defense motion. Given the objection by the DA's Office to the defense request and the seriousness of the crime, the judge is not expected to send the case to juvenile court. In opposing the defense motion, prosecutors also wrote in their response: "Previous efforts to treat, supervise, and rehabilitate the defendant in the juvenile court have been unsuccessful." Both brothers had been on probation at the time of the shooting. Marvin Roberts had been on juvenile probation after having been found guilty of robbery earlier last year. He had been adjudicated delinquent on one count of robbery and inflicting a threat of bodily injury in a case filed Jan. 5, 2017. Counts of simple assault, reckless endangerment, and theft were dismissed. His older brother had been sentenced to a 12-month probationary sentence last May after pleading guilty in two drug-related cases, court records show. The records say he was caught selling marijuana outside a Wawa store on the 1300 block of Walnut Street, and later on the 1500 block of Market Street.